All charter reservations for ACCESS Napa Valley are contingent upon Client’s full understanding and agreement to the following terms & conditions. Wine Tours and Private Charter standard hourly rate is the rate stated on the Customer Way Bill at the time of service. ACCESS NAPA Valley’s rates are posted on our SERVICES page. Advertised rates are guaranteed at the time charter reservation is secured with deposit. Hourly rate includes all taxes, license fees. Any additional charges, such as pickup fees and fuel charges are stated on the Customer Way Bill. 20% service charge will be added to final bill. Services provided more than 30 minutes or 30 miles from Yountville are subject to distance surcharges to cover additional fuel, bridge tolls and other miscellaneous expenses. A $200 deposit (per reserved tour date) will be charged upon booking. When cancellation is requested 48+ hours prior to scheduled pickup time, deposit is non-refundable but may be applied towards a rescheduled charter within one year. Cancellations are not accepted within 48 hours of the scheduled pickup time; client will be billed for 5-hour minimum (weekday) or 6-hour minimum (weekend) charter as applicable. Client may also be responsible for any winery appointment cancellation fees. If Client calls to cancel less than 48 hours prior to scheduled pickup time/date. If Client fails to be present at the designated pick-up location at the contracted time (i.e. “No-show”). If you cannot locate your driver, call 707.738.7983. To avoid being billed as a “No-show,” do not leave your pick-up location without contacting us. You MUST contact us by phone. If ACCESS Napa Valley for any reason beyond its control is unable to perform the chartered service, the Client shall be limited to a full refund of any money paid. ACCESS Napa Valley is not responsible for service delayed or not rendered due to circumstances beyond our control including weather, traffic conditions, road conditions and breakdown. In the event of a mechanical breakdown, we can attempt to make other arrangements for the Client, at the Clients’ own expense, but cannot guarantee replacement transportation. We do not guarantee vehicle availability or pricing for reservation changes. A 50% refund will be given on service time that has been performed before the breakdown and no further time will be charged for agreed upon charter that cannot be performed. 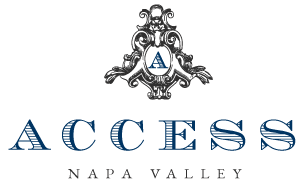 ACCESS Napa Valley reserves the right to substitute the contracted vehicle in the event of a mechanical issue before charter begins, with a vehicle of comparable comfort and quality. Wine tasting fees, parking fees, overtime charges, travel and other surcharges that cannot be calculated prior to service and are not included in the estimate. Client is responsible for the full payment of any overtime charges beyond the original charter agreement. Overtime will be charged in 15-min increments at the hourly rate. The credit card provided at the time of booking will be used for all charges, unless otherwise indicated by the Client. Charges will reflect costs incurred while performing services for reservations placed with us by the Client, its agents, and any individuals requesting transportation as an authorized employee of the Client and will reflect costs including but not limited to trip charges, parking, winery reservations that require pre-paid tasting/tour reservations (only as pre-approved or requested by the guest), and gratuity (at the Clients’ discretion). Our vehicles are strictly non-smoking. Client agrees that there will be no smoking in our vehicle(s). If smoking does occur, Client will be charged $500.00 fumigation/cleaning fee. No eating of food is allowed in our vehicles and a $100-$300 cleaning fee may be charged. At the discretion of driver, violation of our terms regarding smoking/food may result in immediate termination of the services and forfeiture of all paid deposits and fees for service. In compliance with CPUC Regulations, consumption of alcoholic beverages by passengers less than 21 years of age is prohibited. The driver reserves the right to check the identification of any passenger at any time during services if underage alcohol consumption is suspected. The driver also reserves the right to refuse service to anyone under the age of 21 if they are suspected of alcohol consumption. Violation will result in immediate termination of services and forfeiture of all paid deposits and fees for service. Client and all passengers in Client’s party are expected to conduct themselves in a manner not injurious to themselves, to third parties, or to the hired vehicle. All passengers agree to behave in an orderly and well-behaved manner. Client is responsible for any damages to the vehicle caused by him/herself or any guests in his/her travel party. In the event of any physical damage to the limousine caused by Client or any passenger, there will be a minimum additional charge of $500.00 for the repair and/or cleaning of the vehicle. This includes anyone getting sick in the vehicle. Decision as to the unusual use or wear of the vehicle rests with ACCESS Napa Valley solely, and our experience as to the general use of hired vehicles. Client is fully responsible for the repair and/or replacement of any part of the vehicle harmed by any passenger. Repair costs will be charged to Client’s credit card. During repairs, Client may also incur charges for the loss of use/or income generated by loss of use of this vehicle. ACCESS Napa Valley reserves the right to expel any person from the vehicle and/or terminate this contract in the event of a violation of any of these conditions by any passenger. If at any time the service is terminated due to unruly conduct, damages to the vehicle, or abuse of any kind that we deem valid, no refund of money will be made. ACCESS Napa Valley reserves the right to refuse service as it deems appropriate. ACCESS Napa Valley is not responsible for lost or damaged luggage or for any baggage, personal belongings or any items left in the vehicle during or after use of our services. Client waives all claims for consequential damages and agrees that liability shall be limited to the full amount paid to us for the disputed service unless otherwise required by law. You (the Client) and ACCESS Napa Valley (provider of vehicle charter services) agree that any and all disputes and claims relating in any way to this agreement (including the arbitration of any claim or dispute and the enforceability of this paragraph), with the exception set forth in the next paragraph, shall be submitted to and resolved by means of confidential arbitration conducted in the State of California, Napa County. If you and ACCESS Napa Valley cannot agree on arbitrators, the Presiding Judge of the Napa County Superior Court shall appoint them. The arbitration shall be conducted under the then prevailing Commercial Arbitration Rules of the American Arbitration Association (AAA). You and ACCESS Napa Valley may litigate in court only to compel arbitration under this Agreement or to confirm, modify, vacate or enter judgment on the award rendered by the arbitrators. The United Nations Convention of Contracts for the International Sale of Goods, the application of which is hereby excluded, will not govern this Agreement. To the fullest extent permitted by applicable law, no arbitration under this Agreement shall be joined to an arbitration involving any other current or former user of the Service, whether through class arbitration proceedings or otherwise. However, to the extent you have in any manner violated or threatened to violate ACCESS Napa Valley’s intellectual property rights, we may seek injunctive or other appropriate relief in any state or federal court in the State of California, and you consent to exclusive jurisdiction and venue in such courts. If this agreement is referred to an attorney and/or collection agency, Client agrees to pay all attorney and/or collection fees. Should legal action be necessary to enforce any rights or obligations under this agreement, the prevailing party will be entitled to reasonable attorney’s fees and related costs. If one party agrees to waive its right to enforce any term of this agreement, it does not waive its right to enforce such term or any or all other terms of this agreement at any other time. Client has read and understands the above terms and conditions. Client understands that the reserved vehicle charter service is contingent upon acceptance and adherence to these terms & conditions.